Shortly after watching LeBron James win an NBA championship with the Miami Heat, the Rock and Roll Hall of Fame and Museum, after 17 years of toiling away futilely in Cleveland, announced that it would be relocating in Miami immediately in order to "get what I deserve." Following LeBron James' success, the Rock and Roll Hall of Fame and Museum quickly found a new home on South Beach. Neighbors said the museum at first stank of stale beer and failure, but the ocean breeze and sunny skies have cleansed the building, leaving it smelling of suntan lotion and success. 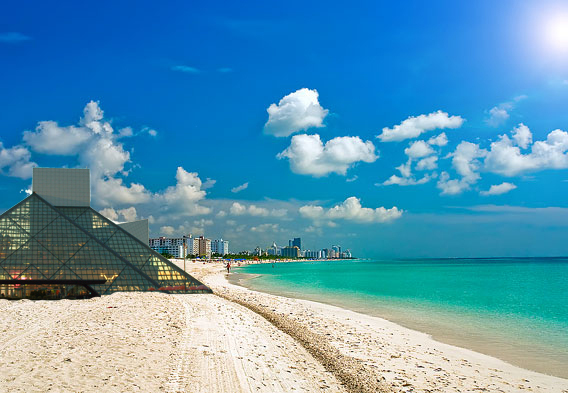 Kicking off an elaborate press event known as "The Rockcision," the museum, now going by the acronym RARHOFM, announced to interviewer Jim Gray that "I'm taking my talented musicians to South Beach," which is celebrity-speak for "Fu@k> You, Cleveland, I'm moving to Miami." RARHOFM explained that after watching LeBron James bail on Cleveland for a better team and better location, and seeing that within two years he received the championship, recognition and glory that he long sought, but didn't find, in Cleveland, that these were the footsteps the museum needed to follow.